"Don’t ever think it can’t get any worse, because it can"
These words speak louder and louder everyday as Ernie Grunfeld stays as the #Wizards GM. Here is the new entry added to the long list of failures. Trading away Jordan Crawford whom turned himself into one of if not the best Wizards assets on the roster for absolutely nothing. Terms were agreed with the Boston Celtics to trade Crawford for Leandro Barbosa and Jason Collins (both on expiring contracts) at the 2013 trade deadline. This would be fine if Crawford did not raise his value while John Wall and Nene were out extensively with injury and Bradley Beal still developing. Averaging 13.2 PPG with an explosive month of January (19.1PPG, 6.1APG, 5.1RPG), Crawford's stock rose tremendously. With the return of Wall, Beal's play (2 rookie of the month awards), and Garrett Temple's solid play Crawford's time diminished from cut minutes to DNP's. Crawford sulked on the bench which in turn brought his value down. If Crawford were to get traded fans expected something worth while in return due to Crawford's play. In return Ernie Grunfeld let the Celtics fleece him. With Grunfeld holding the upper hand due to the Celtics in need of a PG (Rajon Rondo is out for the season) all Grunfeld got in return was a player out for the season (Barbosa - ACL injury) and a player who has produced more fouls then points in 6 of past 7 seasons. 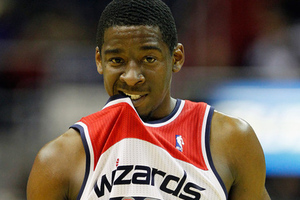 This was suppose to be one of the Wizards best assets. If this is all we can get for Crawford what does that say for our other assets that are not named Wall, Beal, and Nene? Find the full list here or at the top of the page.